Heat your cast iron over medium high heat on the stove and preheat your oven to 400°F. Season one side of chicken thighs using 1 teaspoon of salt and 1/2 teaspoon of black pepper (about 3 - 4 cracks/turns). Set aside. Carefully lay bacon strips in the skillet and fry for 2 to 3 minutes on one side and then flip over and repeat. You want them to get rosy and a little crisp around the edges, but not get super crunchy as we're going to cook them again later in the oven. When you've fried both sides, remove bacon and let dry on a plate that you've lined with a paper towel. If there's a lot of bacon fat in the pan, drain most of it off and then set the pan back to the stove. If there's only a little, leave it in. Add 1 teaspoon of olive oil and bring the heat down to medium. Add minced garlic to the skillet and stir for 30 seconds until it becomes aromatic. Add in the leek slices, stir to combine and then season with a 1/2 teaspoon of kosher salt and a few more turns of the black pepper cracker. If using the dried sage, also add it now. Stir the leeks and garlic occasionally for 5 to 7 minutes; you want to see some caramelization (browning) happening! This means that they're going to be really freaking delicious when this meal is done. While the leeks cook, go back to your bacon and cut it into thin strips about 1/4" wide. Now, here's where things may vary based on the size of your skillet. If you use a 15" or larger skillet, push leeks to the side to make room for the chicken. If you use a 12" skillet, you will probably need to remove the leeks (place on plate w/ bacon) to make enough room for the chicken. This is ok, too - you can always add the leeks back to the pan before we bake - so do what you need to do in order to have room for all the chicken pieces. Once you've decided on your tactic, crank the heat back up to medium-high heat (more heat = more sear). Add chicken thighs to the pan, seasoned side down. Sprinkle a tiny bit more salt and pepper on the unseasoned side once you've added them (it seems like a lot of salt, but I promise that it's not going to taste too salty at the end...this ensures good flavor). Add bacon on top of leeks if they stayed in the pan. Let chicken cook for 4 to 5 minutes on the first side and do not flip over or poke at it too much while it does this. You need to let it sear so that it browns! Once browned, flip chicken over and sear the other side for another 4 to 5 minutes. **See notes below re: using skinless and boneless thighs. If you removed the leeks from the pan before adding the chicken, add them and the bacon back now and just place on top of the meat. Then throw the whole thing into the oven. If you left the leeks in, just move straight to the oven once the meat is browned on both sides. Roast for 8 to 12 minutes. The chicken juices should sizzle and drizzle to the bottom of the pan and create a lovely sauce for the leeks and bacon to bathe in. If you have a meat thermometer, check the chicken (around the 8 or 9 minute mark). You want the inside temperature to reach 165°F. If you don't have a thermometer or are feeling lazy, press your fingers onto the meat. If they feel somewhat firm and don't give too much, they're done. Remove from oven and let the meat rest for a few minutes before serving. 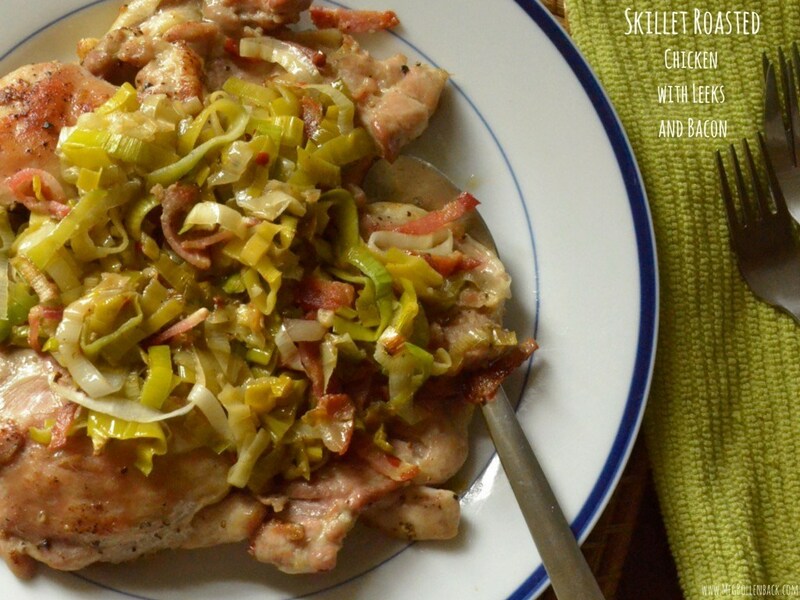 Plate chicken and pour leeks, bacon and whatever drippings are left in the pan on top. This dish is great with any side of grains you like but I recommend rice or a crunchy baguette to soak up the leftover sauce with.